Good evening. I hope you’ve all had a wonderful week; I’m so pleased it’s the weekend again and I have time to rest – so tired all the time! This outfit features a few pieces I’ve wanted to show you for awhile. 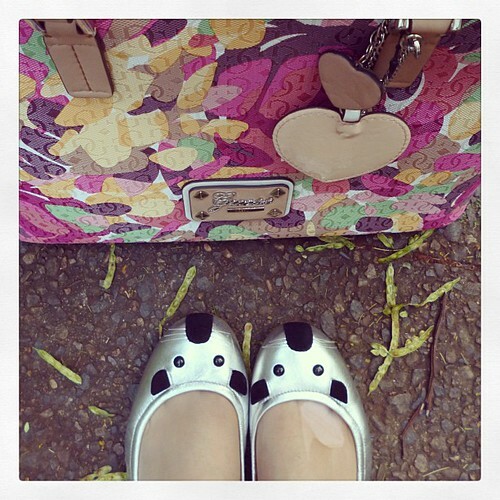 This is my first outfit picture showing my Marc Jacobs mouse flats (featured here). I could seriously wear them with anything so expect to see a lot more of them on my blog. I love them so much! 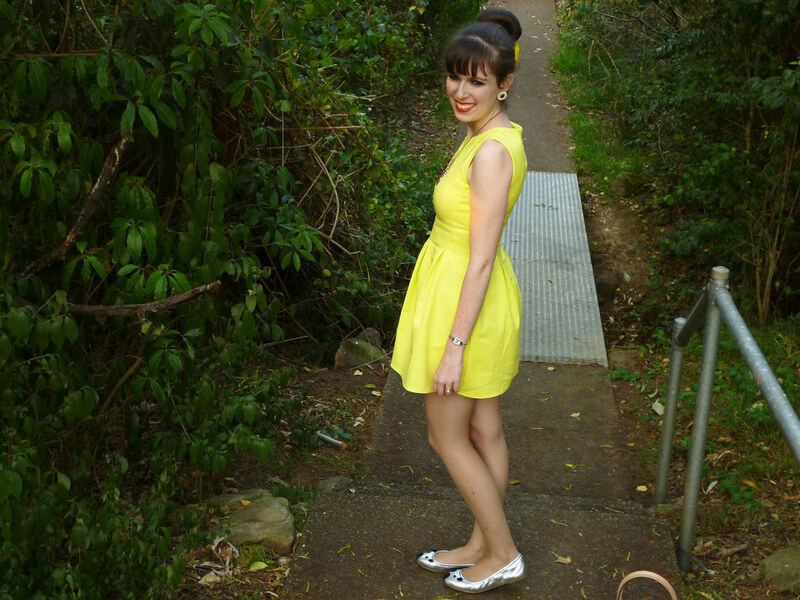 Following on from my recent love of yellow, this is my new dress I received courtesy of OASAP. I’ve wanted a yellow dress for awhile now; it’s perfect for the warmer weather we’re having and I know I’ll get a lot of use out of it in the summertime. 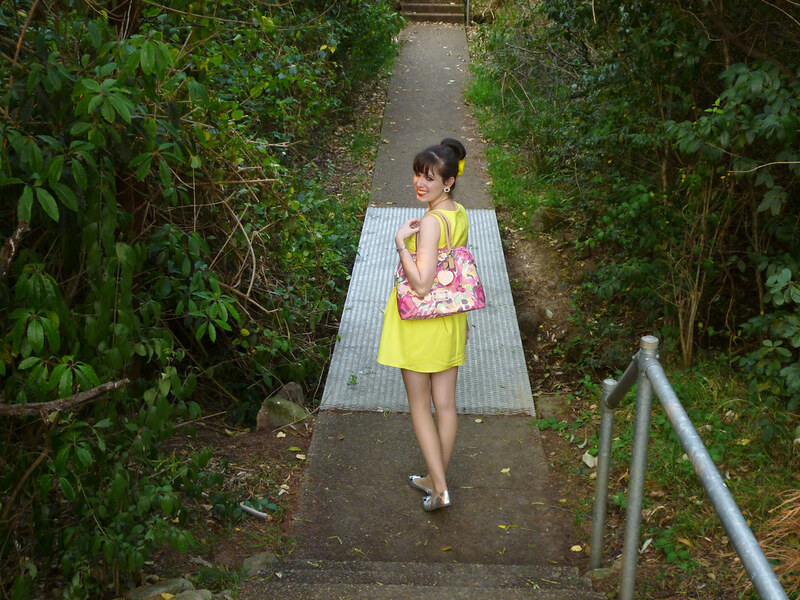 Yellow creates such a fun and happy look; I was extremely pleased to find this on the OASAP website. Not only do I love the colour, I absolutely adore the shape of this dress. Evidently, fit and flare dresses are my favourite and I also love the fit and length of this one. I was so happy when I received this dress and it was perfect in every way. I’ve been so satisfied with all my OASAP orders to date and the shipping is really fast too which is always a bonus. I love the pink version of this dress it’s really lovely too. In fact it looks amazing in the wide variety of colours that it comes in. 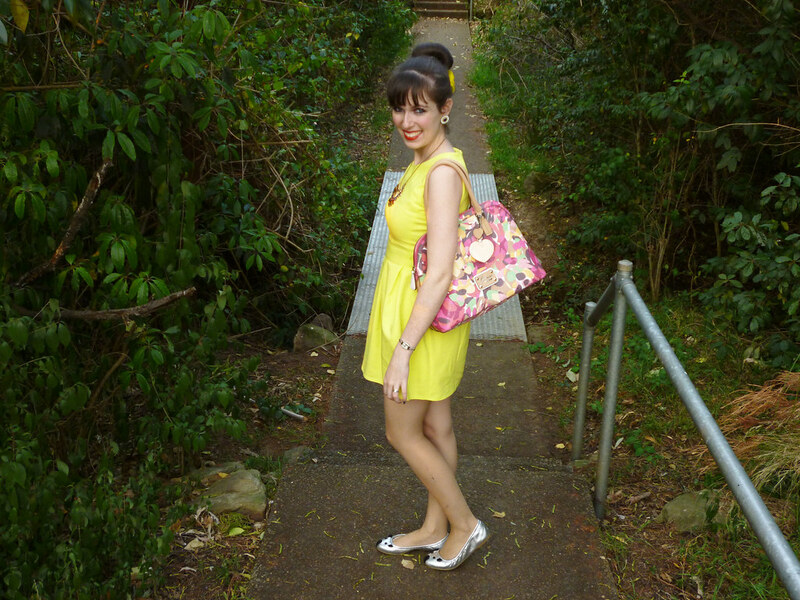 It provides an excellent basis to showcast bold accessories.My bag is a very guilty purchase. When I left my last job, almost two months ago now, I felt so low that I bought it to try and feel better. I didn’t know how else to deal with my feelings. Evidently it didn’t fix the situation but it offered some comfort when I felt really depressed. I love the unique print and colour scheme. I truly blame my sister Sara from The Polished Edge for my recent obsession with Guess bags. They make me feel so classy, as though my outfit is complete; I can’t get enough of them. This entry was posted in Guess, Marc by Marc Jacobs, Marc Jacobs, Outfits. Bookmark the permalink. Perfect style ! This dress is beautiful and I fall in love on your adorable shoes ! Oh my goodness!!! I love it. I love the colour , the dress everything ! U look lovely in yellow and your hair bun.